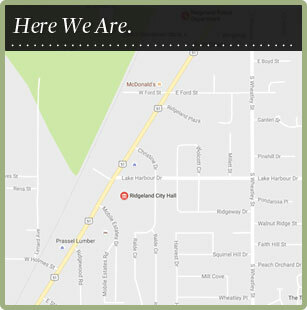 The City of Ridgeland The City of Ridgeland - Ridgeland. There's More Here. It’s time to get back to the basics of good recycling. No plastic bags in the recycling. Visit Waste Management’s new website – Recycle Often.Recycle Right. – for up-to-date information on current recycling information. The City of Ridgeland Public Works Department through Waste Management will pick up limbs and leaves weekly on one of the regular pick up days for solid waste. They will pick up trees, shrubs and brush trimmings or newspapers and magazines not exceeding five (5) feet in length or 60 pounds in weight. Leaves must be bagged with all waste (5) feet back from the curb or roadside ditch. There are also knuckle boom trucks that pick up limbs and yard debris once a month for work the homeowner or occupant has done that does not meet Waste Managements specifications. Use this map to determine your pickup date. These limbs will not be picked up if it was cut by a contractor or any paid labor. The total volume of debris should not exceed 12 yards or one truckload any amount over that the homeowner is responsible for. Please give public works a call if you have any questions, 601-853-2027. If you are a resident of the city of Ridgeland, you already know! We simply have more here! Families and individuals thrive in Ridgeland with the benefits of award winning schools, premier shopping, fine dining, abundant outdoor recreational amenities, and plenty of festivals and cultural events. All of our residents enjoy a convenient location in the metro area, access to a scenic park, the Natchez Trace Parkway, a 33,000 acre lake, the Ross Barnett Reservoir, and an extensive walking and biking trail system. One of the most decorated cities in the state of Mississippi, nestled in Madison County, Ridgeland has an award-winning master plan that is being used to guide our community development efforts, incorporating green spaces and smarter developments. Ridgeland is recognized as a Tree City USA, a Bicycle Friendly Community, top 100 place to live named by MONEY® Magazine in 2007. Visitors feel a uniquely warm welcome when doing business, shopping, dining or relaxing in a very special community that blends big city energy and small town charm. Whether you are training for a marathon, having a family outing or enjoying a classic dining experience, Ridgeland has it all.